Posted 11-1-18: For a fourth straight year, DEC’s Region 4 Fisheries organized a group effort in support of this popular riverwide public outreach event. A main goal of this event is to combat the Nature Deficit among our youth, mostly from local grade schools. Originally extending along the Hudson River Estuary—HRE from Troy down to NY Harbor, this event has expanded into the upper (non-tidal) Hudson and lower Mohawk River drainages. In 2018, we gathered up 16 inter-agency personnel from DEC Region 4 Fisheries and the Van Hornesville fish hatchery, the Natural Heritage and OPRHP in Albany, the NYS Museum (fish lab), and a DEC retiree rounded out our team. Lastly, DEC officers from Schenectady and Rensselaer Co. plus a retired college professor each visited one or more of the HRE stations to engage the students and faculty. 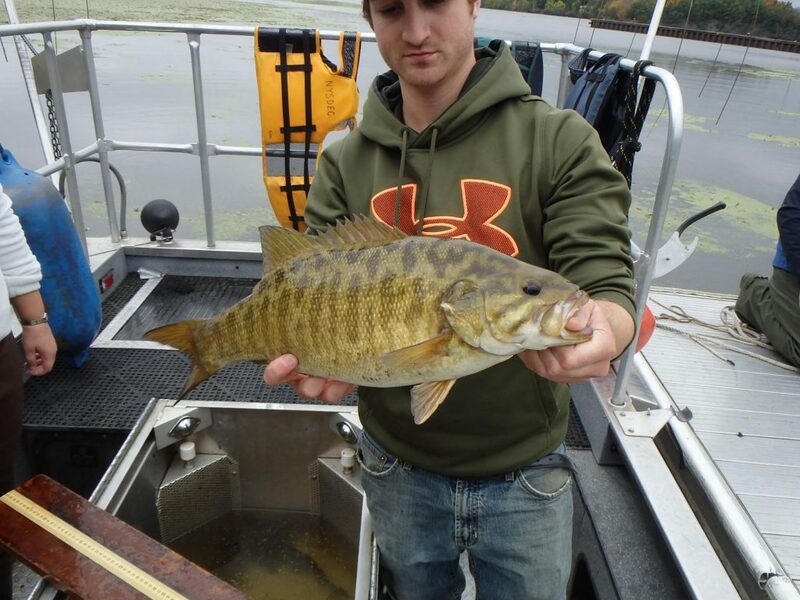 As usual, R4 Fisheries began river sampling the day before (Oct 15) with a 9-person crew teaming up to electrofish three different sites in the lower Mohawk/upper Hudson River from Niskayuna east to Waterford then south to Troy. Almost 300 fish comprising 27 species were captured in only 2.18 hours of boat shocking due to the cool, breezy weather with light rain (ideal). Many of the large and more hardy river fishes were held in live cages for on-site retrieval and display the following day. Some of these fishes and others captured by the Hudson River Fisheries Unit were delivered to various river stations in the HRE on Tuesday morning. On event day, various state professionals combined forces with faculty, staff, and parents to educate students in the greater capitol district on river habitat like water quality, fish identification, anatomy, behavior, while answering a slew of other river-related questions. Beach seining was also common at some for more favorable (sandy) sites, along with backpack shocking (Schoharie Creek). We expect most enjoyed a fun time with their respective school groups that ranged from grades 1-12. New sites included Hoosic River at Hoosick Falls and Riverfront Park on the Hudson, both in Rensselear Co. Also new at station Green Island, local RPI faculty hosted a homeschool and undergraduate college class. Team Stamford replicated their impact from last year, covering 13 schools at 10 river stations where some 561 students or about 56 youth/station came to learn about the various rivers on a cool but mostly sunny and dry autumn day with high tide at 11:00am in Troy and a water temperature of 59 °F. This year we extended our coverage (staff and/or fish) to about 72% of all river stations in DEC Regions 4-5 and hope to do better in 2019. It was another very successful outreach event that has grown to showcase the Hudson’s diverse resources to almost 5000 students each October for the last 16 years. 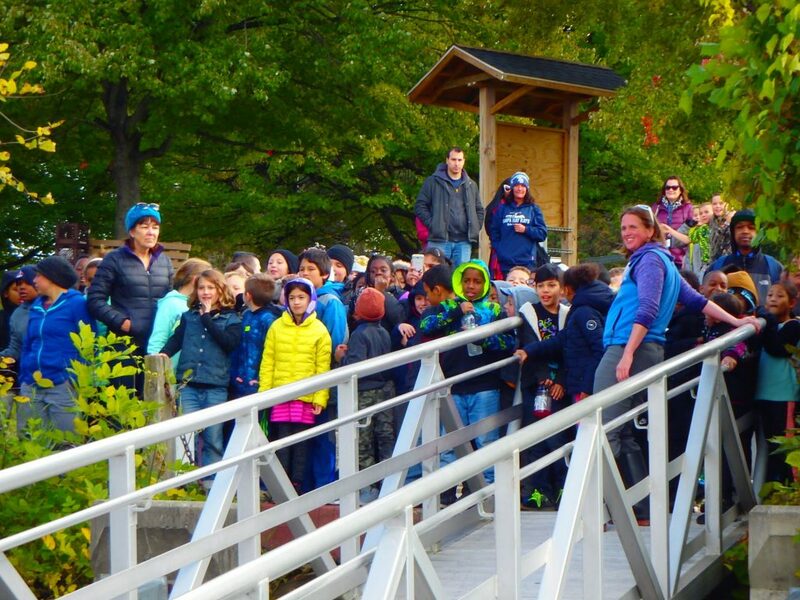 Each outreach event like ‘day in the life’ brings us closer to understanding the dynamic aquatic world in the Hudson River watershed.